Welcome to the present day, Mr von Goethe. You’ll be turning 269 this year, and to date no one has been able to compete with your body of work. Why do you think that is the case? Some books seem to have been written not to teach us anything, but to let us know that the author knew something. Applause, like love, can only be desired, never demanded. These days we seek applause via social networks. Likes and followers are the current currency of applause. The world judges by appearances. The choice of objects reveals the true nature of a man, who he really is. If you look at the leading headlines of the last few months, you cannot help but wonder about the nature of man. Why is Trump president of the USA? How did Brexit come about? To act is easy, to think is hard; to act according to our thoughts is troublesome. Patriotism ruins history. You see, nothing is more disgusting than the majority because it consists of a few powerful predecessors, of rogues who adapt themselves, of weak who assimilate themselves, and the masses who imitate without knowing at all what they want. 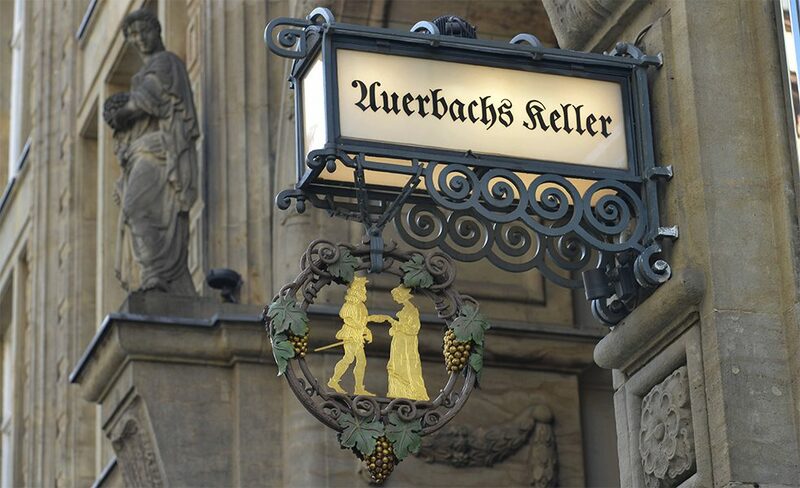 A popular student pub back in Goethe’s student days, Auerbachs Keller is still a beloved wine bar in Leipzig today. It was mentioned in the play “Faust I“, earning it a worldwide reputation. | Photo (detail): © picture alliance/Arco Images So we are to blame for the situation we’re in? Yes and no. Indeed, I was perfectly convinced that a great revolution is never the fault of the people, but of the government. Revolutions are utterly impossible as long as governments are constantly just and constantly vigilant, so that they may anticipate them by improvements at the right time. The media hugely influence the mood of the people. The spread of fake news in particular is reported to have swayed recent elections around the world. Why do so many people choose to believe news reports that are clearly fake? We are never deceived; we deceive ourselves. For in the end, we only hear what we understand. Usually, when a person hears only words, they believe that there must be something to think about. 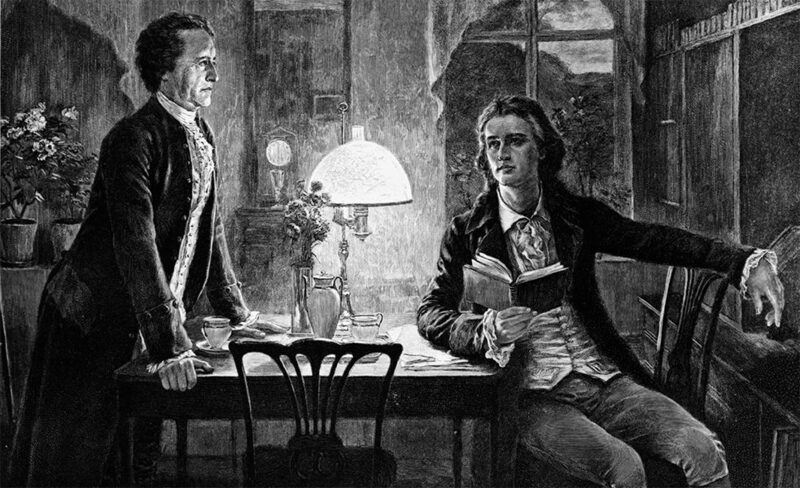 Good friends who inspired each other: Goethe and Schiller’s frequent exchange gave birth to a new literary movement – Weimer Classicism. | Photo (detail): © picture alliance/akg-images Some have said we are living in a time of intolerance. In practice no man is tolerant! Many assure us that they willingly leave each to take his own way; yet all endeavour to exclude from action every one that does not think as they do. You are well travelled, spent a number of years in Italy, and even talked about feeling reborn there. What fascinates you about travel? No one can walk beneath palm trees with impunity, and ideas are sure to change in a land where elephants and tigers are at home. One does not travel in order to arrive, but for the sake of the travel itself. Everything that happens to us leaves some trace behind; everything contributes imperceptibly to form us. Indeed, I may say that only in Rome have I felt what it really is to be a man. To this elevation, to this happiness of feeling, I have never since arisen. Do you have any final words of wisdom for us? If you miss the first button-hole, you will not succeed in buttoning up your coat. 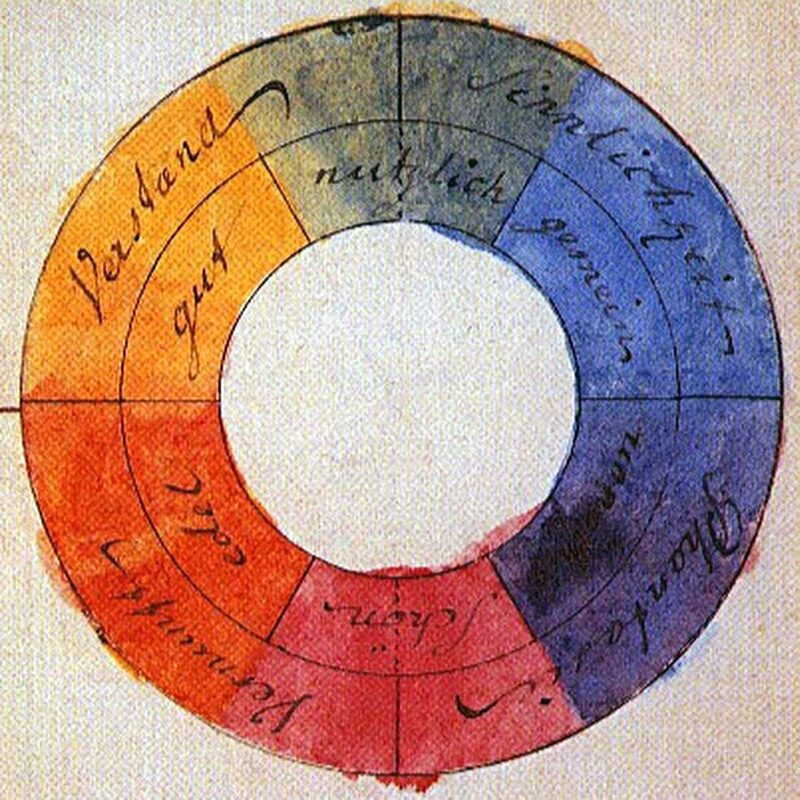 Goethe’s watercolour rendering of the colour wheel from 1809. In his three-volume work “The Theory of Colour”, Goethe shares his views about the nature of colour as a phenomenon. | Photo: © picture alliance/CPA Media * This interview was recorded in 2018. With the exception of a few words added here and there, Johann Wolfgang von Goethe said all of the above during his lifetime. Johann Wolfgang von Goethe (1749-1832) is still considered the one of the greatest figures of German literature. Indeed his work shaped an entire era that bears his name, the Goethezeit (Goethe Era) also known as Weimar Classicism. Considered a universal genius, Goethe was a writer and poet, but also a scientist, lawyer and statesman. Many of his personal experiences found their way into his writing. Die Leiden des jungen Werther (The Sorrows of Young Werther) was supposedly born out of his unrequited love for Charlotte Buff, and Auerbachs Keller, a pub Goethe frequented as a student in Leipzig, achieved world fame as a setting in Faust I. In addition to time spent in Straßburg, his hometown of Frankfurt am Main, and Italy, Goethe lived most of his life in Weimar. His productive collaboration with Friedrich Schiller, who also resided in Weimar later in life, gave the city its reputation as a place of poets and thinkers, and made it the namesake of an entire literary movement, Weimar Classicism. Goethe was also an enthusiastic student of the natural sciences who explored mineralogy, anatomy and physics, attended medical seminars and autopsies, and completed a three-volume work on the theory of colours. Sarah Klein is editor-in-chief of the Tea after Twelve online magazine and managing director of the Bunny Island GmbH communication agency.